KANSAS CITY, MO – Whitecaps FC 2’s incredible season ended in Swope Soccer Village on Saturday evening, as the second-year USL side suffered a 3-0 loss to Swope Park Rangers in the USL Cup Playoffs. Reaching the Western Conference Final in their first-ever postseason run, the young ‘Caps fell to a red-hot Rangers side, who did not look back after Kris Tyrpak’s first-half brace. Swope Park, who now have won nine of their last 10 matches, await the winners of Sunday afternoon’s Eastern Conference Final between New York Red Bulls II and Louisville City FC. The USL Cup Final will be played on the Eastern Conference champions’ home field on Sunday, October 23. Whitecaps FC 2 head coach Alan Koch made two changes to the lineup from last week’s dramatic West semifinal win, inserting Marco Bustos and Deklan Wynne in place of the injured Thomas Gardner and Will Seymore, while sliding Brett Levis from left back to the attacking wing position. The adjustments looked primed to pay dividends early, with Levis and Wynne in fine form combining on the left flank. The home side had other plans, however. In the eighth minute, Ayrton connected with Christian Duke on the left side to set up Mark Anthony Gonzalez for a sliding strike. WFC2 goalkeeper Spencer Richey made a fine reaction save on the initial attempt but Tyrpak collected the rebound for the putback goal to give Rangers the early lead. Tyrpak struck again in the 32nd minute. Midfielder Tyler Pasher, one of four Canadians on the Rangers starting XI, dribbled to the left endline then served up a low-driven cross past a pair of WFC2 defenders to an opening inside the far post. Tyrpak stepped to the space and side-footed a shot into the roof of Richey’s net for his second goal of the half. The ‘Caps managed possession well, creating chances for Bustos and Daniel Haber, but were not able to cut into the home side’s 2-0 lead going into halftime. WFC2, resilient all season, left it all out on the pitch in the second half. Kianz Froese, who scored in each of the previous playoff matches, launched another long-distance attempt on 70 minutes, forcing a full-stretch save from Swope Park’s Adrian Zendejas. Fatawu Safiu and Thomas Sanner came off the bench to give WFC2 more options in the comeback effort but the former Liga MX goalkeeper was steady in the Rangers net. Dane Kelly, the all-time leading scorer in the current USL format, put the game out of reach on the counter-attack in the 89th minute. Rangers lost Nansel Selbol in added time after the substitute forward was shown his second yellow card due to a reckless tackle. As a result, Selbol will be suspended for next week’s USL Cup Final. With the win, Zendejas improves his perfect USL record to 8W-0L-0D. 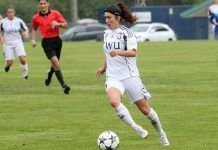 Overall, the season was a success for Whitecaps FC 2, who notched a 15-point improvement from last season, while pushing two players – Levis and Alphonso Davies – to MLS contracts. Furthermore, the team accelerated the development of the club’s young prospects, including 13 teenagers who saw pitchtime, while thriving in a highly-competitive USL Western Conference. If the 2016 USL season is any indication, the future looks very bright for WFC2.